Every angler should have a quality fillet knife, preferably two. If you’re serious about fishing, you’re going to catch a lot of fish. The best type for big jobs is an electric knife. If you just have two or three fish you need to fillet then a traditional filet knife works the best. Check out the two best fish fillet knives we could find. One is traditional, the other is electric. We took utility, blade sharpness, and value into account. The Buck Silver Creek model is our top traditional knife. Buck Knives has a long history of producing quality products that perform and last. Every knife they make includes an impressive warranty. You’ll likely never have to send the knife back due to failure, but if you do they will replace it. The Silver Creek Fillet was already one of the best fish fillet knives on the market when Buck released a folding version. The blade is corrosion resistant and titanium coated. It has just the right amount of flex for filleting fish. Total length of the blade is 6.5″. When completely open the knife total length is almost 14″. The Silver Creek is an excellent size for filleting most fish. The handle is a thermoplastic base with a rubber mold and a stainless steel guard. An attractive blue scalloping pattern fits the hand well and provides a comfortable holding point. In addition, the balance is exceptional. With an overall weight of 6oz, the Silver Creek feels substantial while remaining light enough to reduce fatigue if you plan to use it for extended periods of time. It doesn’t feel like an inexpensive knife. The blade sharpness is perfect right out of the box. Usually, the blade will go an entire season without needing to be sharpened as it holds an edge exceptionally well. We selected this knife for two reasons. First, it feels like a much more expensive knife, but it comes at a price everyone can afford. There are knives that cost ten times what the Silver Creek Fillet sells for. We can barely tell the difference. Second, we like that it folds. 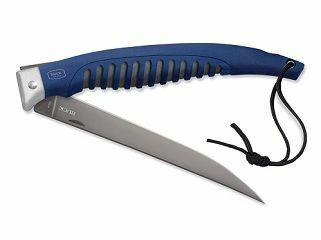 Folding knives are particularly well-suited for boating use because they are easy to safely store when they aren’t in use. It really comes down to value. Other knives increase in price because of the materials and where they are made. The Silver Creek, for example, skimps on blade steel. It’s made of 420J2 steel. This is a type that was never intended for knife production. Modern manufacturers still use it for knives because it is less expensive. Silver Creek uses a titanium coating to help bolster the hardness of the steel, but over time with moderate use that coating may start to wear off. More expensive knives use more expensive blade steel. You don’t really notice the difference until years down the road. Overall this a tremendous value. You could buy five or six, maybe as many as ten Silver Creek Fillet Knives for the cost of the best fish fillet knife money can buy. When it comes down to it, you should buy the Silver Creek and spend your money on more important pieces of gear. The American Angler Pro is our top choice for electric models. If you catch a ton of fish, you likely want an electric knife to fillet them all. Manual knives can quickly induce fatigue. The best one we could find was the American Angler Pro. We love the versatility of the American Angler Pro set. It comes with 5 blades for every possible fillet application, a carrying case, and a protective glove. American Angler uses a gearing system to power the knife. It provides more overall torque and cutting power than any electric fillet knife on the market. The included blades can handle anything from the smallest to the largest catch. A small 5.5″ blade is ideal for most freshwater catches and the 8″ blade is perfect for the bigger fish you’ll find in freshwater lakes or streams. Three saltwater blades are also included. The two shark blades and one 10″ saltwater blade will cut through just about anything. In operation, the Angler Pro is smooth and efficient. The ergonomic handle helps reduce fatigue and the blade just keeps right on moving, allowing you to fillet as many fish as you have time for without discomfort. It’s not going to work on your boat unless you have 110 volt power outlets. For operation on-board you might want to look at the Berkley Deluxe Electric Fillet Knife. It has a boat battery and car adapter. The American Angler Pro is superior, but isn’t well suited for on-boat use.